Another new central agency for sale by the Fraser Yachts team as I learn that Michael Selter in the San Diego office and Tom Allen in Seattle have jointly listed Cape Horn's 24.99m pocket megayacht Quan Yin for sale. 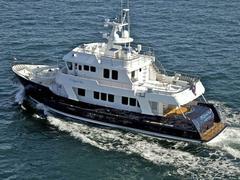 She's a rugged, sturdily built expedition superyacht with global capabilities and a 5,000 nautical mile range. Her rich cherrywood interior sleeps six guests in a master, VIP and double and there are berths for up to four crew. Currently lying in San Diego, Quan Yin is asking $3.9 million.